Have you ever noticed that most small apartments seem to be white? 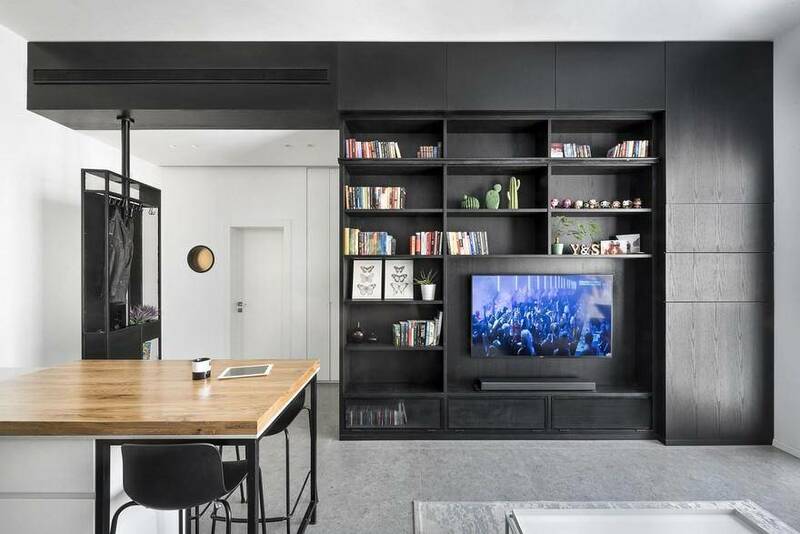 In this 44 sqm apartment, the choice of black veneer proves the strong effect a dark color has on a small space. 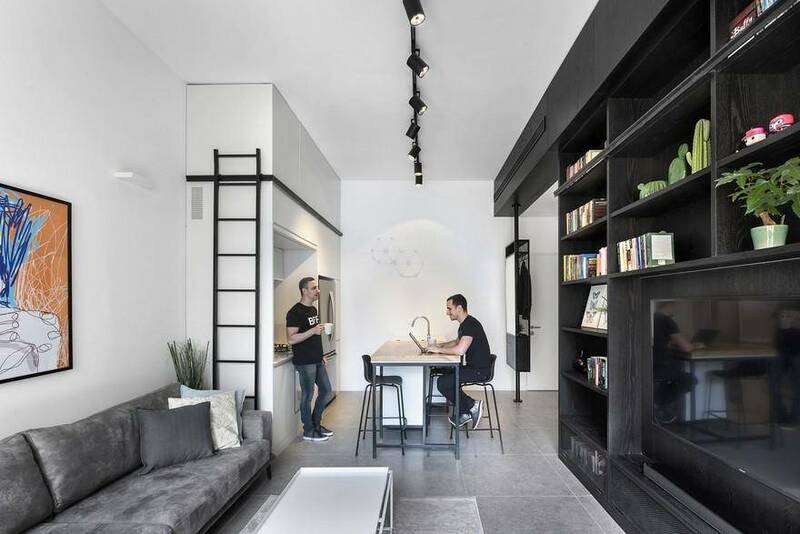 The apartment, located in a beautiful preserved building with high ceilings in the center of Tel Aviv was designed for a couple of successful career men and their dog. The apartment is located in a building at the city center with preservation status. Architects: Dov Hershkowitz, 1931 and Bar-Orian, 2017. 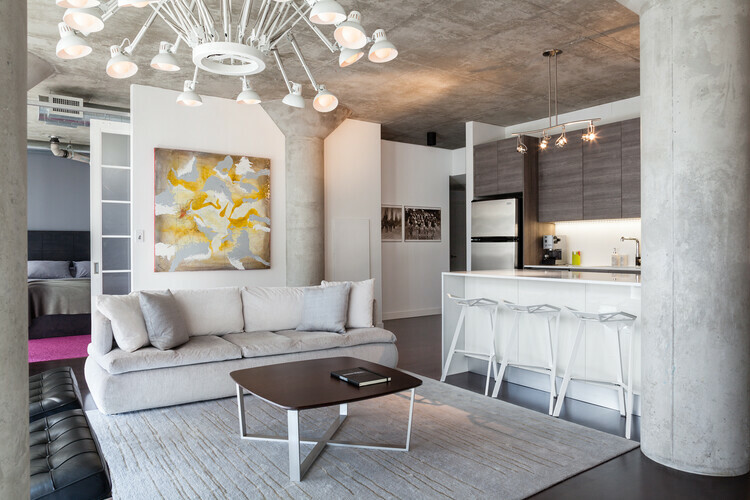 Despite the small floor area, the high ceiling of the apartment gives a sense of spaciousness. 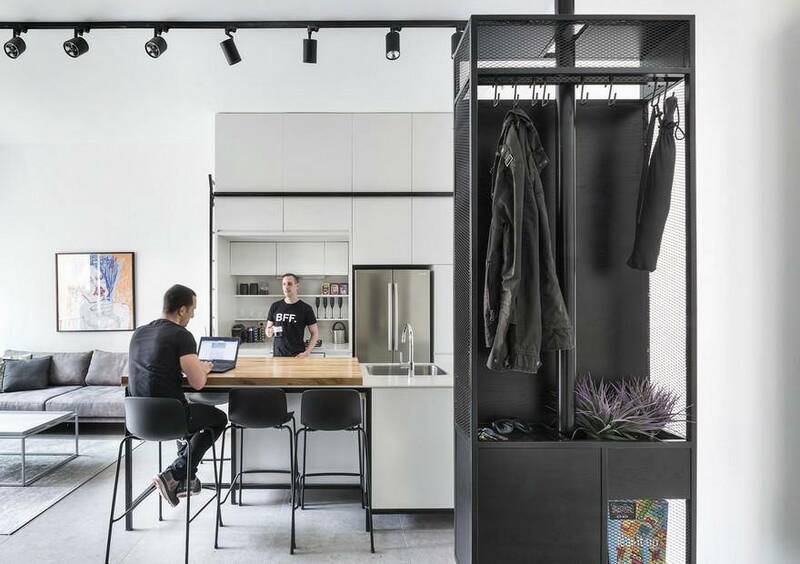 As if the challenge of a 44-square-meter apartment for two tenants wasn’t enough, about 12 square meters are non-movable shelter room walls. 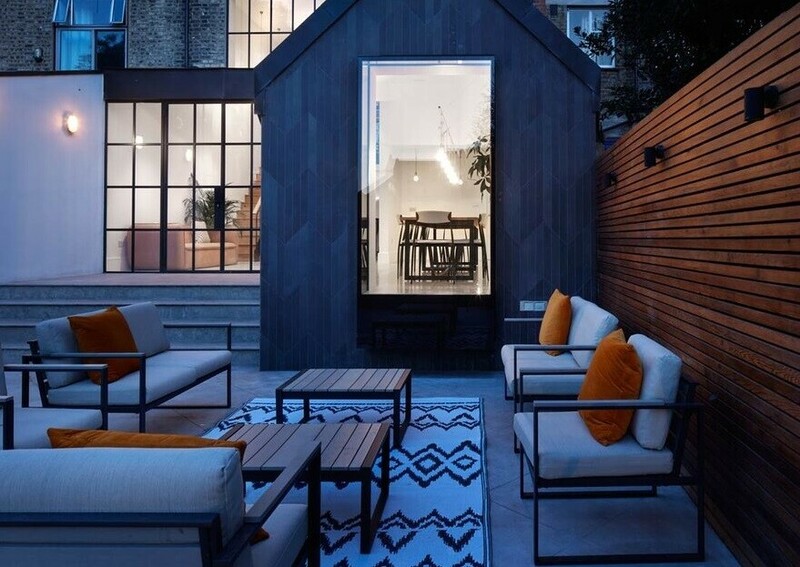 Hence, it is important for the rest of the space to be as open as possible. 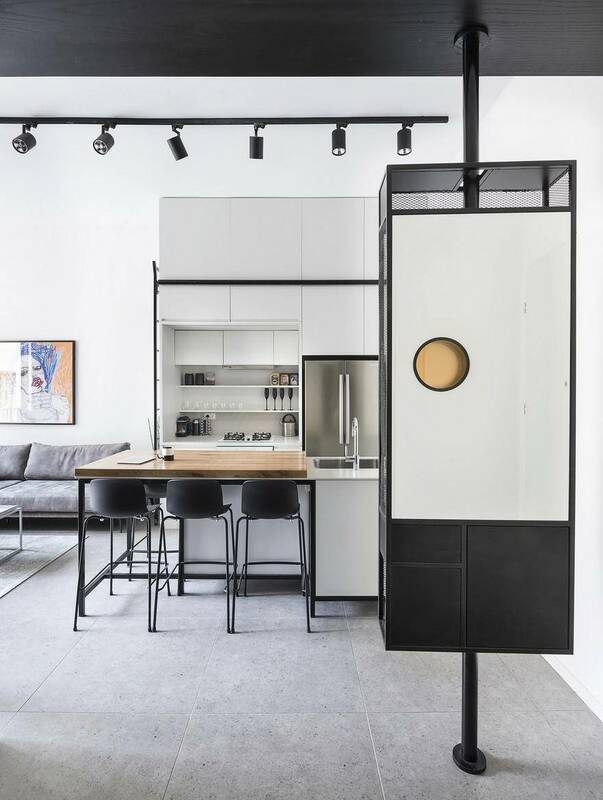 In order to avoid partitions, the functions are located on both sides of the main living space: the kitchen and sofa on one side and the dark cabinetry on the other. 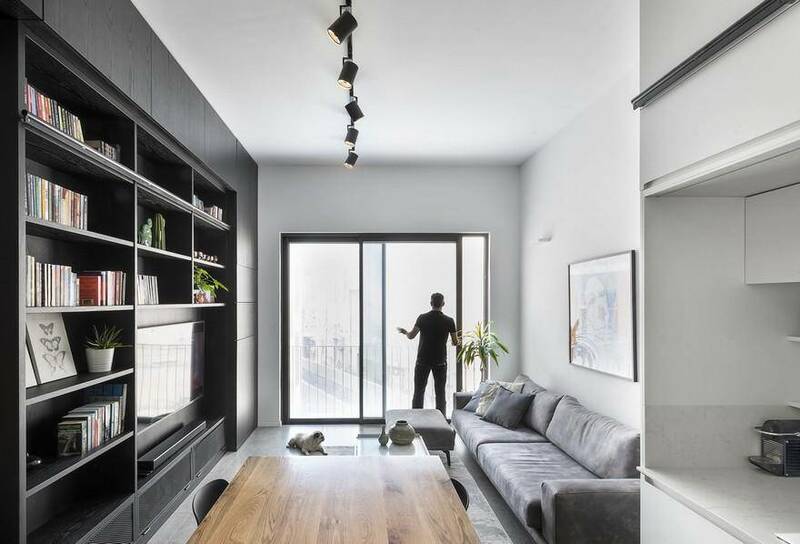 At the far end of the space a wide glass window brings the urban landscape and light into the apartment. 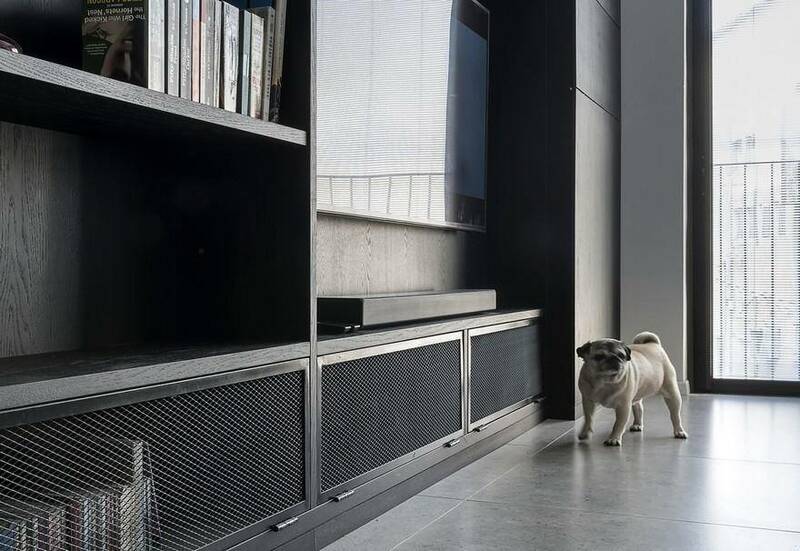 A huge wooden cabinet covered with black veneer accompanies the public space. The cabinet stores functions such as a liquor bar, audio system, air conditioning and more. Books, collections, television and ornaments are displayed on the cabinet’s shelves. On the entrance side, the cabinet makes room for “the Pole Dancer”. 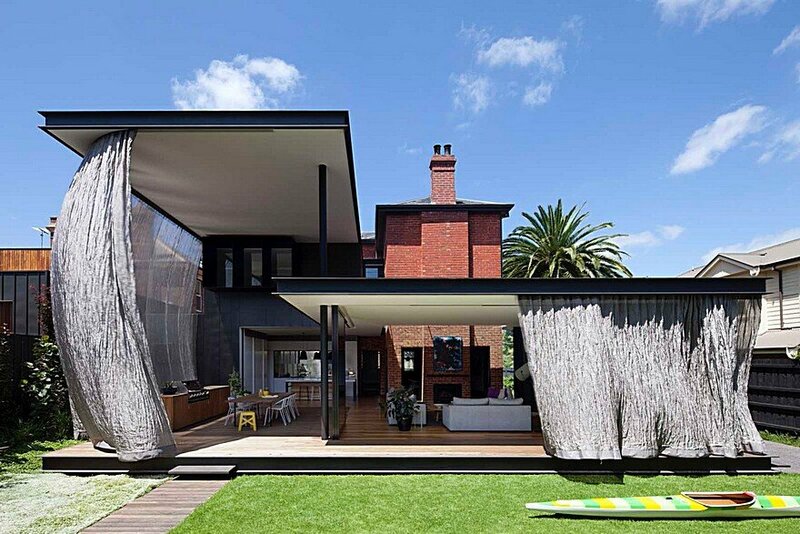 Height plays a significant role in the feeling of this space and its use. 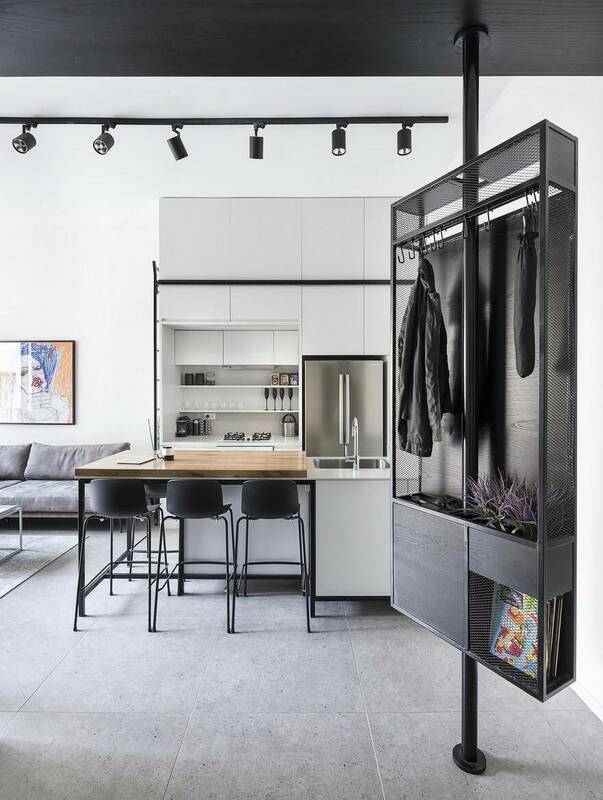 A ladder embedded in the kitchen Cabinet allows easy access to the high storage in the kitchen and cabinet on both sides. The pivoting entrance piece was one of the initial lines sketched for the apartment. We searched for a lite element that would define the entrance and wouldn’t block it. 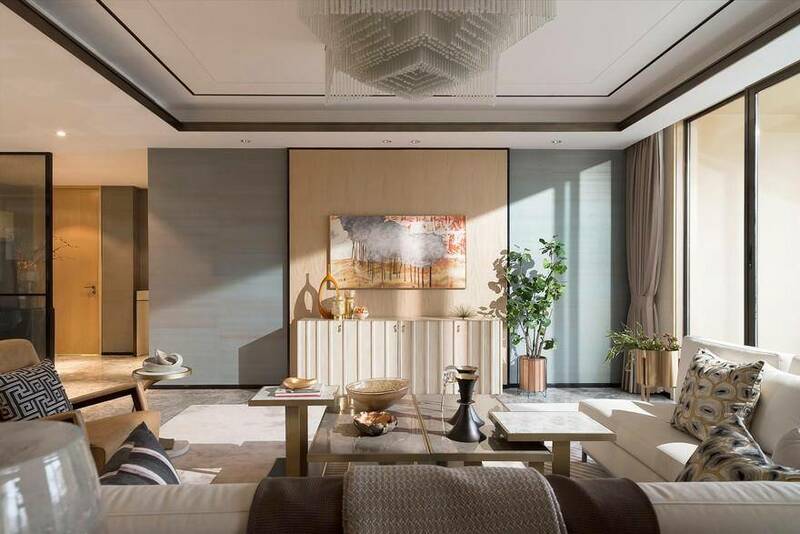 The piece gives a filtered initial look into the kitchen and directs the view through the living room to the outside. The pole dancer is made of lite and airy materials (steel mesh, mirror, steel and very little dark veneer-covered wood) which almost completely conceals it. Additionally, it spins on a pivot, creating a dynamic and lite feeling unlike the other furniture, which is heavy and fixed to the walls. 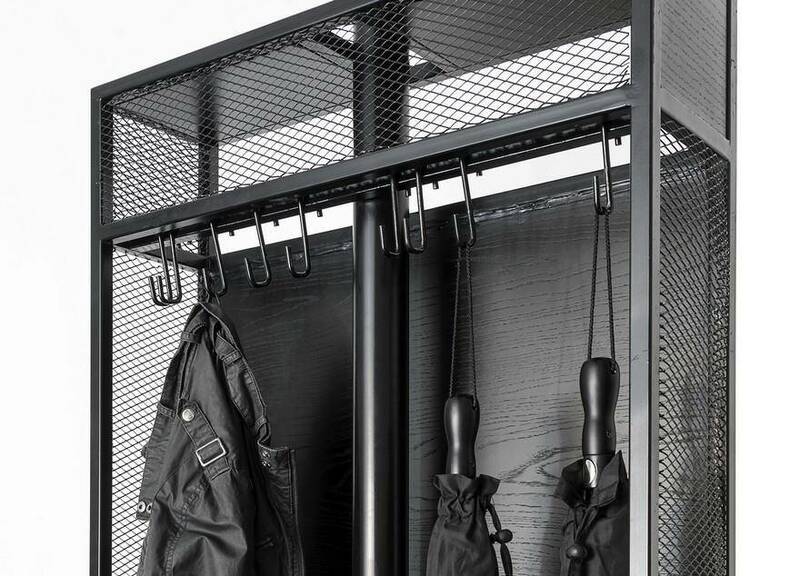 Functionally, one side of the dancer has a place for hanging coats, putting down the keys, newspapers and mail, and on its other side, a mirror. 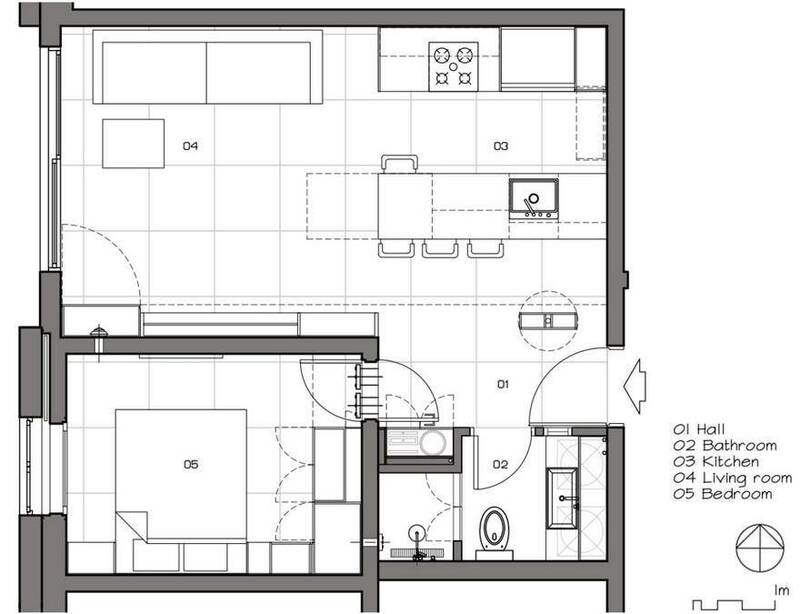 In such a small apartment every square-meter counts. Since the tenants don’t cook a lot, we created a minimal working surface in the kitchen. On the other hand, the tenants said that when hosting, they like to cook and be part of the conversation. 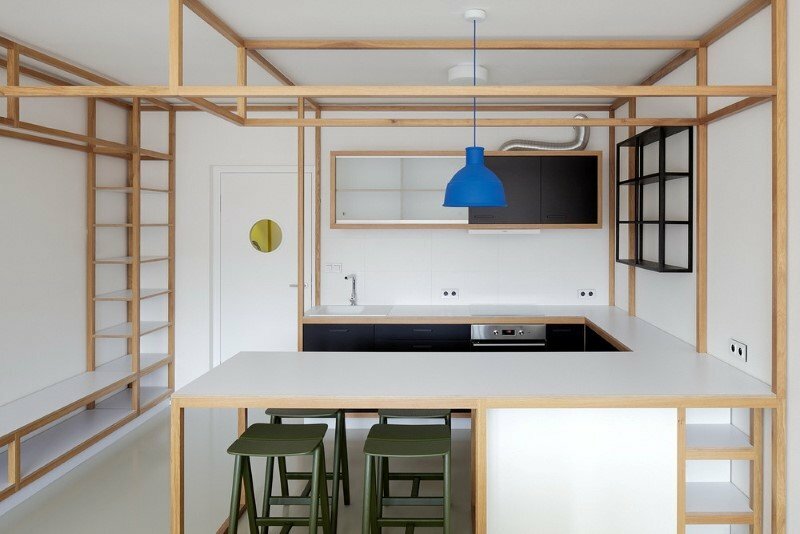 Therefore, the moving wooden plate on the kitchen’s work surface allows more seating space and more work space at the same time. The bathroom is in the common area near the entrance. In order to allow some natural light, we created a large circular window with frosted glass. The window complements the unique appearance of the rotating furniture. 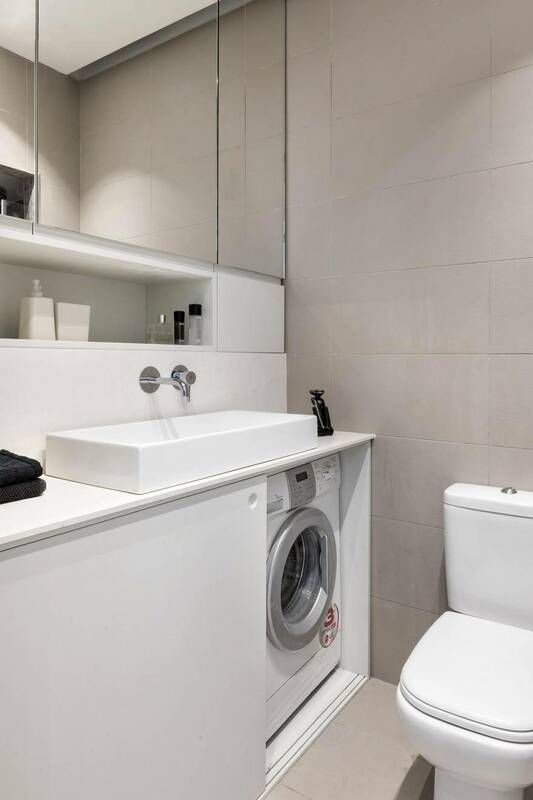 In order not to waste valuable kitchen space, the washing machine and dryer were placed in the bathroom under the sink. 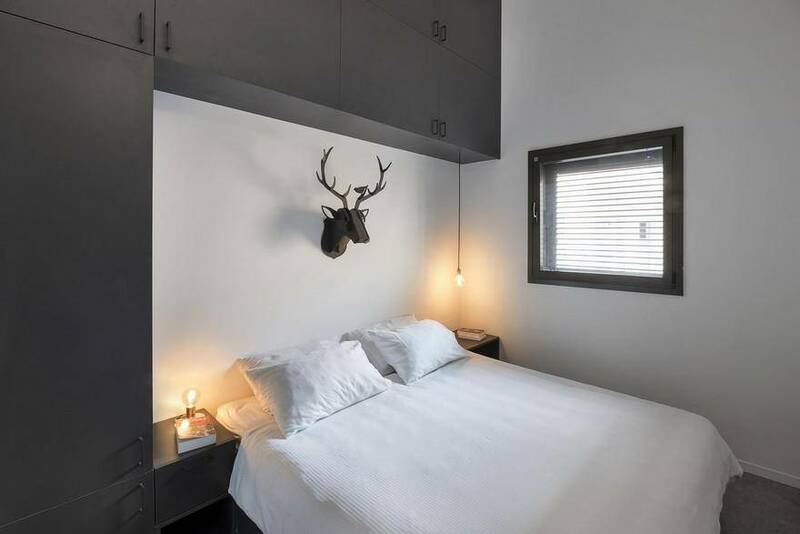 The only bedroom in this small apartment is the Mamad (safe room), about 10 sqm. This was the only option to place a bedroom without compromising the quality of the common area of the apartment. 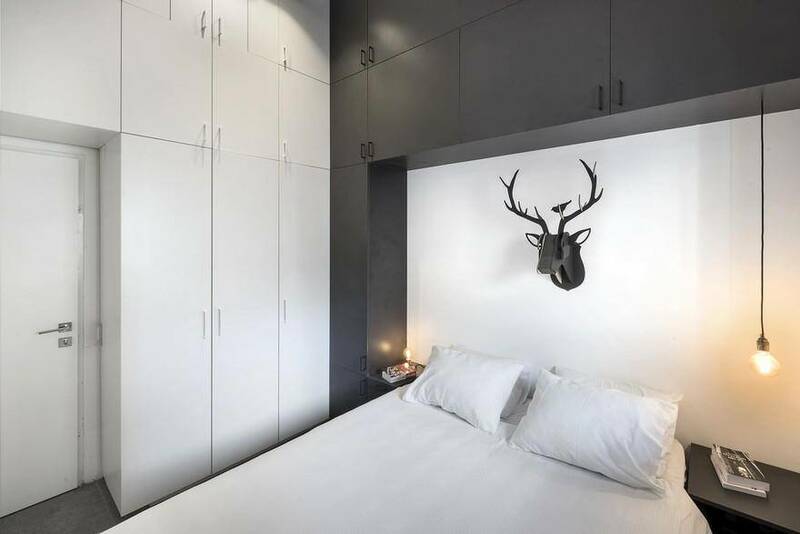 So, when the tenants asked for a cozy bedroom with plenty of room to store clothes, the need for flexibility within this predefined space arose. This need created a piece of furniture that envelops the bed and goes on to another side to store clothes and other household items.